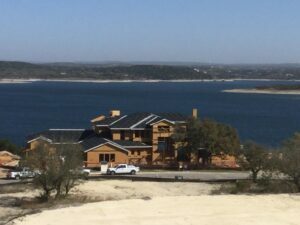 Prime real estate on Lake Travis is hard to find… until now! 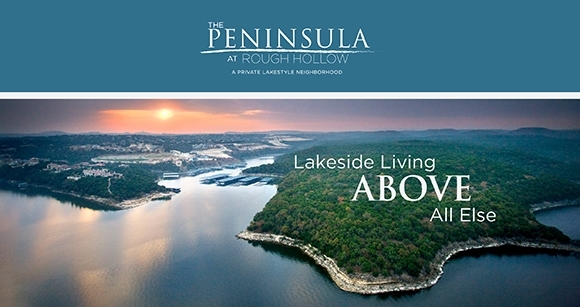 The Peninsula at Rough Hollow in Lakeway, Texas has gorgeous waterfront and water view homesites available and Sterling Custom Homes is ready to help clients through lot selection, design and construction of their unique custom home on the lake! We’ve begun construction on the very first water front home in The Peninsula at 623 Casasanta Trail, taking full advantage of perhaps the very best views on the entire lake! In all we have nearly $10 million of projects in design and construction for this popular community. Our friends at Rough Hollow Development have been wonderful to work with as we navigate through the approval process in preparation for construction. It’s important to choose a builder who has a thorough understanding of the community guidelines and great rapport with the developer so information can be shared and compromises (if any) can be reached to achieve the client’s goals. Sterling has been cultivating those relationships for nearly 30 years! For more information about The Peninsula and to learn more about the unique processes we’ve created for our client, please call Gary Grambley at (512) 263-2214 or email gary@sterlinghome.com.